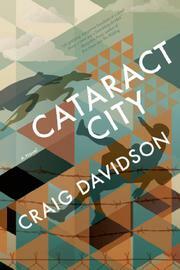 Snowmobile chases, cigarettes and snub noses: Canadian novelist Davidson’s (The Fighter, 2007, etc.) latest is a down-and-dirty look at life on the quiet side of Niagara Falls. Canadians are reserved, polite and law-abiding, non? Not so. Davidson opens as if with a country song, as Duncan Diggs is preparing to leave prison after 2,912 nights, of which “two were the longest: the first and the last.” Even if the prison is glad to see him gone, and even if he makes a halfhearted vow to get things right this time, Dunk can’t help but be a screw-up; he’s a jailbird now—“a distance had settled into his eyes,” our narrator says—and about the first thing he does is look for fresh trouble. He finds it. How could he not in a town where everyone’s high on bath salts or malt liquor, where the only growth industries are bare-knuckle boxing and petty crime? Dunk aims to improve his lot with a slightly better class of criminal, a reservation rat who runs counterfeit cigarettes from one side of the Niagara River to the other, grabbing at whatever other illicit opportunities present themselves. If Dunk is somewhat one-dimensional and elements of Davidson’s storyline are predictable—of course his childhood friend is going to be a cop, of course they’re both going to have their eye on the same woman, of course things aren’t going to end well—criminal mastermind Lemmy Drinkwater is a fully rounded hoot. It stands to reason, too, that any character named Bovine is a font of comic possibilities, if not ones for the squeamish. The story goes on a few beats too long, especially its protracted conclusion. Still, the icy chase scene that brings things to a head is worthy of Hitchcock, and Davidson’s writing is assured and nuanced even while giving tough-guy noir a good working over. “It’s a big world out there,” our narrator tells us. So it is, and while you wouldn’t want to live in this corner of it, it’s well worth a visit.